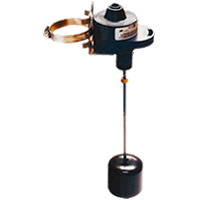 There are two types of battery backup sump pumps - DC and AC/DC. Battery backup systems will switch to DC battery power when the AC power is out or when the pump fails. But while the power is on, some pumps can run directly off the AC wall current without depleting the battery. Units which run exclusively DC power will only pump off battery power. Another thing to consider is which type of battery you choose. 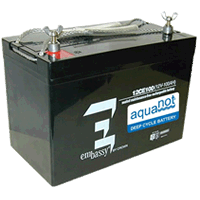 There are deep-cycle "maintenance-free" batteries, often sold as marine or solar batteries, as well as lead-acid batteries, otherwise known as "wet cell" batteries. You'll find wet-cell batteries most commonly used in vehicles. These batteries do require you to add distilled water occasionally to keep the lead cells from drying out, preventing premature damage. Maintenance free batteries are fully sealed, which you can set and forget. The other main reason battery backup pumps are called into service is during a rain storm or rapid snow melt. If the primary sump pump cannot handle the amount of water in the pit, your basement can start to flood. A battery backup unit with a float switch installed above your primary pump can solve this problem. When the primary pump can't keep up and the water rises in the pit, the backup sump pump goes to work. You can essentially double your pumping power with a backup pump. Some companies have pioneered sump pump technology to keep up with the smart phone era. 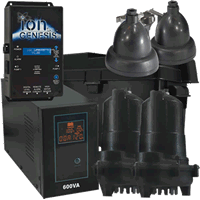 You can program the most high-tech backup sump pumps to text or email you in the event of a sump pump emergency. These pumps can be markedly more expensive than regular backup pumps, but if you've spent lots of money finishing your basement, it's a worthwhile investment. Battery Backup Sump Pump Buyer's Guide.. Our Power Equipment Direct how-to library can help you learn about Proposition 65 Product Labeling, Introducing Barnes Sump Pumps and Sales Tax Information.